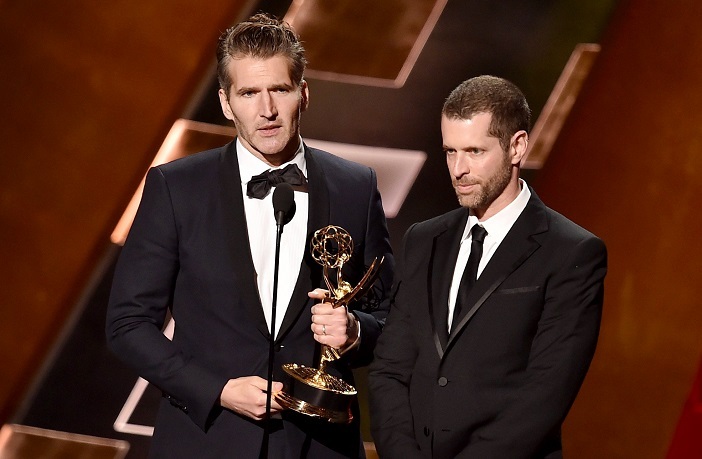 In a recent EW interview, Game of Thrones showrunners David Benioff and D.B. Weiss spoke candidly about the last season of their fan-favorite ultimate HBO hit. The pair shared behind-the-scenes insights about creating the hugely anticipated final episodes, what it’s been like to work with author George R.R. Martin, and avoiding spoiler leakage. They also shared their favorite scenes and rare arguments. Below are some highlights from the interview. You’re used to giving scripts to your cast and hearing their reactions. Your cast has such ownership over these characters and you only had six episodes to wrap the story. Were you nervous when you sent them out? BENIOFF: We knew exactly when our script coordinator sent them out. We knew exactly what minute they sent them. And then you’re just waiting for them to email. WEISS: Why aren’t they writing? Does that mean they like it? Does that mean they hate it? How much of this season is from discussing the ending with George R.R. Martin? BENIOFF: [The concern] used to be that the books would spoil the show for people — and luckily it did not, for the most part. Now that the show is ahead of the books, it seems the show could ruin the books for people. So one thing we’ve talked to George about is that we’re not going to tell people what the differences are, so when those books come out people can experience them fresh. WEISS: It’s kind of nice for him because — obviously through necessity we’ve pulled out ahead — the show has become so different [in recent seasons]that people will have no way knowing from watching what will or won’t appear in the books. And honestly, neither do we. BENIOFF: We don’t. And George discovers a lot of stuff while he’s writing. I don’t think that final book is written in stone yet — it’s not written on paper yet. As George says, he’s a gardener and he’s waiting to see how those seeds blossom. So let’s tease the final season a bit. What excites you about these last episodes? BENIOFF: Part of what excites me is the performance of these actors. So many of them have been with us since the beginning and they’ve grown — both literally for the kids, and as characters. In many cases, they’re going so far beyond what was expected for them. Some, like Lyanna Mormont [Bella Ramsey], were just supposed to be in one scene. Bella is such an incredible actress that we kept bringing her back because we wanted more Bella. And in some cases big actors like Lena [Headey] and Peter [Dinklage], you go back to the pilot where they were already great and you look at how much richer those characters have become. To know them this well and to have their voices so clearly in your head when you write for them is a such a rare gift. WEISS: Sometimes they’ll deliver a line and I’ll think, “No, that’s not the way you’re supposed to say that.” Because their voices are so burned into my brain. But whether it’s Maisie [Williams] or Kit, you have to go, “Do I know how they’d say that? Because they’re them.” So you take a breath and realize maybe their way is better. For each of you: What is the scene you’re most proud of in the whole series? BENIOFF: That two-episode arc that Miguel directed [“The Battle of the Bastards” and the season 6 finale, “The Winds of Winter”]. The montage where Cersei got her revenge against the High Sparrow. So many departments came together so beautifully, and Miguel’s direction was incredible. WEISS: “The Battle of the Bastards” turned out very well. But I hope it will be a scene in this season. It’s nice to go out on your strongest notes. To read the full version, head over to EW. 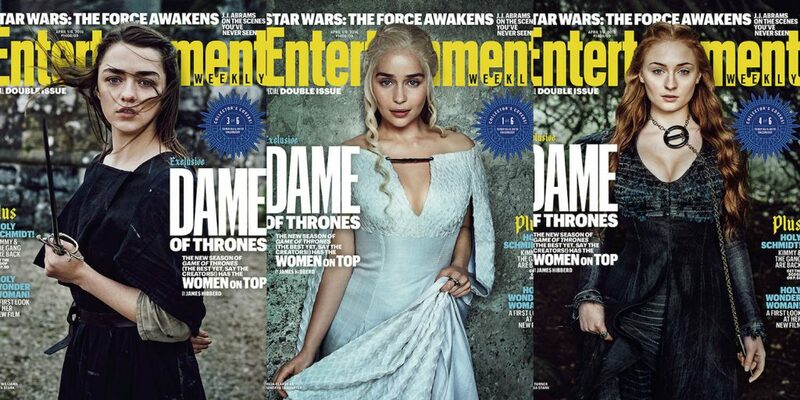 Game of Thrones returns April 14th on HBO.